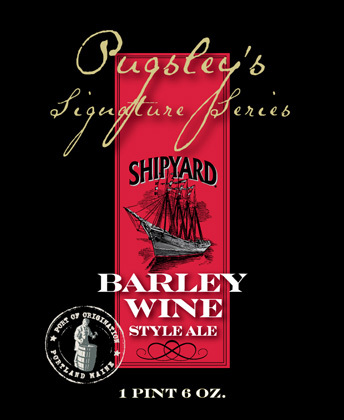 Shipyard Brewing announced today the launch of Pugsley’s Signature Series line, and the first two products in the line, a Barley Wine Style Ale and an Imperial Porter. The new beers will be available in November, in 22 oz. bottles and on draft. 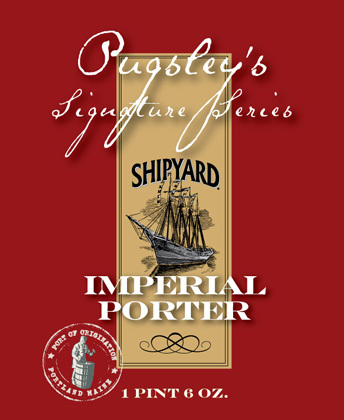 Pugsley’s Signature Series is named after Shipyard’s master brewer, Alan Pugsley. Pugsley is from Hampshire, England where he worked with Peter Austin at the Ringwood Brewery, before moving to the U.S. in 1986. Barley Wine Style Ale is a big beer made with six different malts (Pale Ale, Crystal, Caramunich, Wheat, Chocolate and Roasted Barley) and balanced with a very full hop charge of Summit, Challenger and Fuggles hops. It is a deep reddish brown color with a complex fruity nose, a very full body, and an interesting balance between grains and hops which ends with a pleasing dry taste. To fully enjoy all the flavors, this ale is best drunk at 55 degrees Fahrenheit. 8.5% alcohol by volume. Imperial Porter is a full bodied, very dark, malty beer with a good roasted character coming from the Crystal, Chocolate and Black Patent Malts used in the mash. Warrior, English Fuggles, and East Kent Goldings Hops balance the malts with a good hop bite. The beer has an OG of 1.070, rounding out after fermentation with just a slight residual sweetness and cutting dry at the finish. 7.1% alcohol by volume.